Fourth Row Center: Film Writings by Jason Bailey: Backfilling: "Kramer vs. Kramer"
Robert Benton’s Kramer vs. Kramer won five Academy Awards in 1980, and it’s easy to see why: the performances are remarkable, the filmmaking is direct and efficient, and it tells the kind of intimate, familial story that tended to get Oscars in that era (the following year, Raging Bull was robbed of its Best Picture nod in favor of Ordinary People). It’s a very good movie, even if some of the storytelling is a little too convenient and the direction is occasionally clumsy (a continuity error here, some soft focus there, and a howler of a badly pantomimed “conversation” in a wide shot near the end). 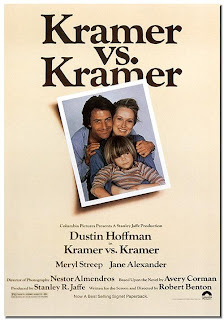 What Kramer vs. Kramer does, better than any film I’ve seen, is to take basic domestic situations and make them so relatable and vividly drawn that they just knock the wind out of you. The organic escalation of the French toast preparation or the famous ice cream dinner has the natural tension of good documentary, Some of that is good writing, and some of that is expert playing—Dustin Hoffman is flat out terrific in one of his finest performances, and little Justin Henry (who, at eight years old, was the youngest actor ever nominated for an Oscar, and he deserved it) is every bit as good. Meryl Streep is also very strong, even if her cross-examination scene isn’t terribly credible. Some of the movie is a little too easy, and it might have been more powerful (though certainly more depressing) if it ended about two minutes sooner. But it’s mighty good all the same.